Showtime Auctions is excited to be presenting the entire Gus and Trisha Brown Advertising Collection over three days on iCollector.com on October 7th to 9th, 2016. An eye popping array of over 1600 lots will be available for live and online bidding from around the world. This auction also includes part one of the Tiny Moyer Salesman’s Sample, Child’s and Toy Stove Collection. In addition, Showtime Auctions will be offering over 80 antique cash registers from the incredible Eric Hambey Collection. And last but not least, a wonderful representation of Firearms and Gunpowder advertising posters and calendars from the Curt Bowman collection, will round out the highlights of the sale. Bids are currently being accepted online through iCollector.com right up until the live auction day. As summarized in the auctioneers description: “Included in this auction will be Advertising Signs, Country Store, String Holders, Soda, Coca Cola, Candy, Gum, Peanuts, General Store, Millinery, Shoes, Firearms and Gunpowder Posters and Calendars, Veterinary, Farm, Cash Registers, Toys, Banks, Salesman Samples, Automobilia, Petrolinana, Matchbooks, Pens, Soap, Coin-Op, Gambling, Slot Machines, Jukeboxes, Trade Stimulators, Tobacciana, Music Boxes and much, much more”. Showtime Auctions and iCollector.com are truly offering something for every bidder and collector in the world. The most valuable piece on the first day of the auction is an extraordinary tin sign at Lot 352. This is an extremely rare Ghiradelli Cocoa Die Cut Tin Sign that is valued at auction as high as $20000; and may exceed that estimate as it is so highly sought after. This is a chain hanging three part sign and is something that very few collectors, if any, have ever seen in person. Made by the Beach Art Co of Coshocton, Ohio, this has fabulous colors and is in excellent condition. Measuring 16 ¾” by 18 “ it is a collector’s dream buy at auction. A pair of photos are online for inspection and pre auction interest has been significant. Over into day two is an even more valuable advertising sign and a true gem for serious collectors. 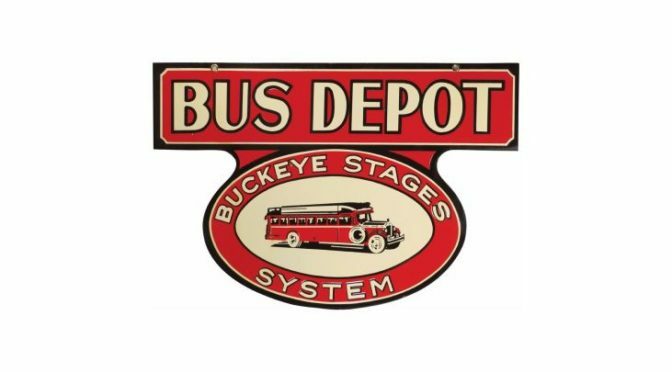 Lot 977 presents a Bus Depot “Buckeye Stage” System Porcelain Sign. It is deep shelved porcelain with great color and graphics. The auctioneer does not know of another one of these still in existence so it is as rare as they come. It only has some minor edgewear and has magnificent beauty. It measures 30 “ by 20” and is a centerpiece for any advertising collection. Bidding opens at $10000 and the pre sale auction high estimate is $60000 in value. Collectors of antique gaming and slot machines need to focus their attention on the third day of the auction. Lot 1798 is the highlight slot machine of the sale. Up for grabs is a Caille Bros New Century Upright Slot Machine. This is in a beautiful Quartersawn oak cabinet and is with all its original parts. It is in good working condition and even comes with tokens. A true masterpiece of gaming collectibles and the auctioneer estimates this is worth as much as $25000. Bidding opens at $5000 and a grouping of quality photos are up for viewing. The full catalog is showing on iCollector.com right up until auction day. Absentee bids can be placed now and registration is easy. Interested bidders can contact the auctioneer through the website to ask questions, and Mike and Lori Eckles will be pleased to answer all questions brought to them. This is the best auction of the Fall for collectors and expected to be a highly entertaining and rewarding event for bidders, auctioneer, and consignors.